Layers of translucent architectural forms, imbued with light, give the impression of a suspended city—views compelling from every vantage point. 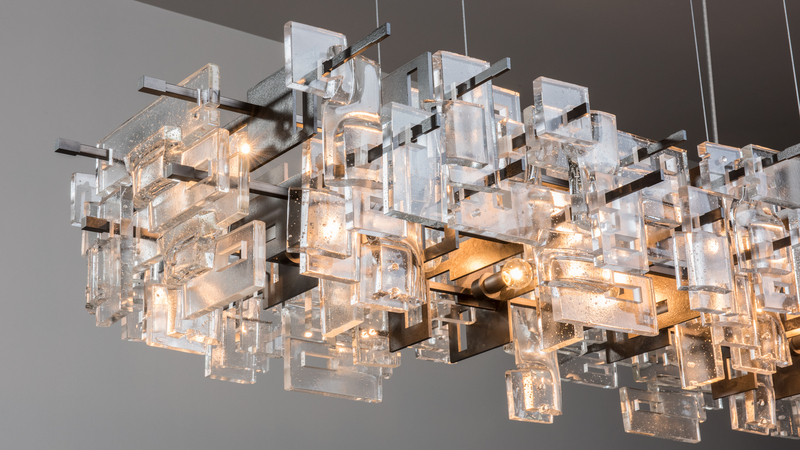 Comprised of 64 thick glass segments, each having been fused into individual compositions, the Fusion Pendant presents luminosity on a grand scale. Art + Alchemy’s Design and Development engineer Jason Hancock, speaks about the design process. 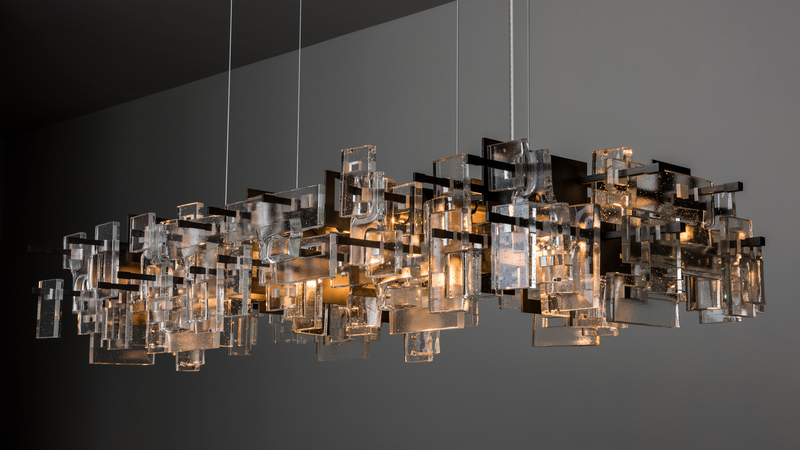 The steel framework is an artful composition in its own right, with the positive and negative spaces from interlocking planes, echoing the geometric forms of the glass. 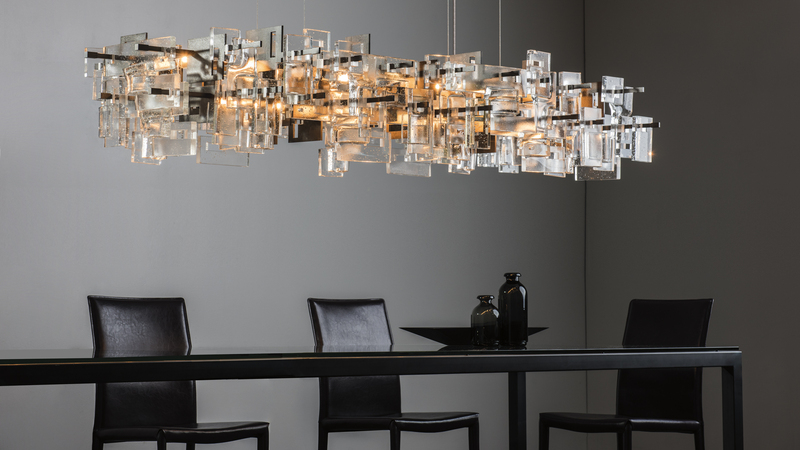 Finish selection transforms the personality of the fixture; shifting the relationship between glass and metal. A Gold finish possesses optimal elegance, while Dark Ash draws out the inner structure. 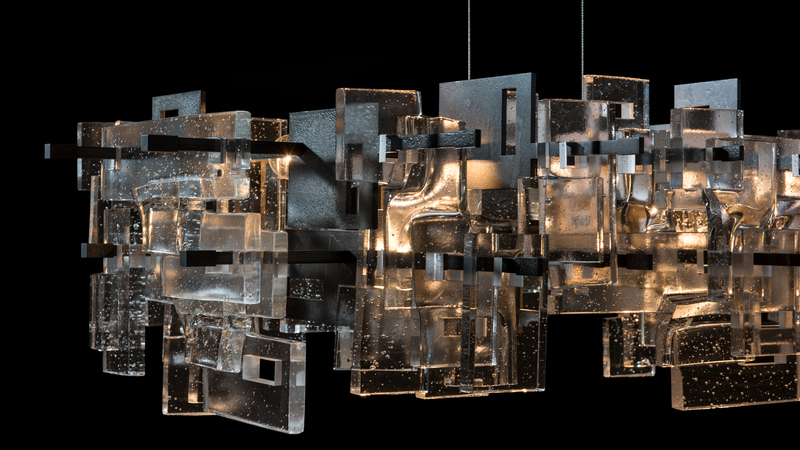 The Clear Steel option offers a forged textural element, and balances the aesthetic between glass and steel components. The Fusion Pendant is suspended by 4 thin aircraft cables, with a cloth cord providing an unobtrusive power source between the canopy and the fixture. 16 iridescent lights are staggered in-between structural tiers to provide even and warm illumination. Available as shown, or customized per your imagination.